Safety-critical systems, in which failure could result in loss of life, major property destruction or environmental harm, pervade our society. Such systems are governed by regulations which prescribe traceability between hazards, mitigations, design, code, and test cases. Further, they require the construction of a safety-assurance case which provides evidence in the form of arguments with supporting traceability, that the system is safe for use. SAREC has several ongoing projects in the domain of Safety-Critical systems. We recently received funding to investigate traceability in safety-critical product lines. $444,326 SHF: Medium: RUI: Collaborative Research: Advanced Traceability for Composing Product Line Safety Cases, 07/01/2015 (4 years) (Collaborator Robyn Lutz, Iowa State University). Total award $850,000. 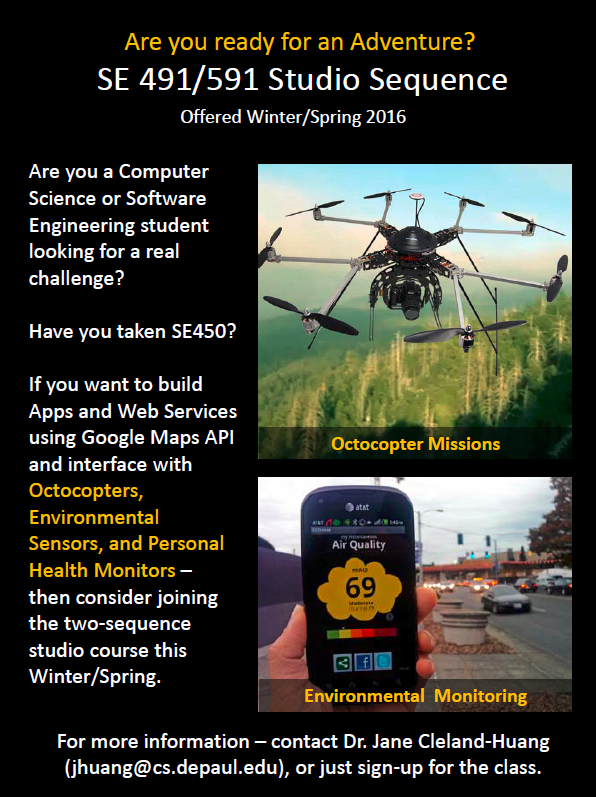 Master students in DePaul's Software Engineering program will build Quasi Safety-Critical Systems in the Spring/Winter 2016 quarter.